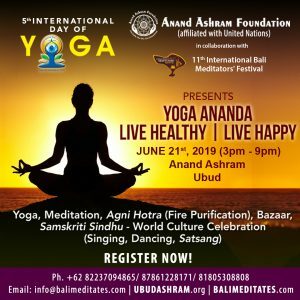 This policy relates to the privacy practices of INTERNATIONAL BALI MEDITATORS’ FESTIVAL (“we”, “our” or “us”) in connection with https://balimeditates.com/ . It sets out the basis on which any personal data that you provide to us, in connection with the Website will be processed and disclosed by us, in accordance with Irish data protection legislation. We are not responsible for the content or privacy practices of other websites. Any external links to other websites will be clearly identifiable as such. We may also use your personal data to send you e-mail alerts about important changes or developments to the Website and to send you customer satisfaction or marketing surveys in relation to your subscription or registered account with us, in order to ascertain how we may improve our service to you. We may disclose personal data relating to you to our agents, service providers and professional advisers and/or to such other third parties as may reasonably be required in connection with the purposes referred to in this Policy or as otherwise required or permitted by applicable law. This may involve the transfer of your personal data to a country outside of the European Economic Area where the level of data protection is not as high as in Ireland. We will only retain your personal data for as long as we require it for the purposes referred to in this Policy, unless we are required by applicable law or regulation to retain it for longer. If you cancel your subscription or delete your registered account for the Website and delete the INTERNATIONAL BALI MEDITATORS’ FESTIVAL mobile app from your mobile device we will delete any personal data we hold in relation to you as soon as reasonably possible and will immediately discontinue collecting any further personal data in relation to you. You have the right, subject to certain exemptions, to obtain a copy of any personal data which we hold about you (for which we may charge you a small fee) and to have inaccuracies in the information corrected. If you wish to avail of any of these rights, please contact us info@balimeditates.com . In order to protect your privacy, you may also be asked to provide suitable proof of identification when making such a request.